NYTimes: Baz Luhrmann's Australian film "Strictly Ballroom" is, in short, pure corn. But it's corn that has been overlaid with a buoyant veneer of spangles and marabou, and with a tireless sense of fun. (The film's outrageously glittery get-ups, according to production notes, "exhausted Australia's supply of Austrian diamantes, which were used on everything from costumes to fingernails," and the film makers no doubt made a dent in supplies of hair mousse and peroxide, too.) Though none of it can be taken more than half-seriously, "Strictly Ballroom" tells an enjoyably hokey story with flair. The Guardian: Strictly Ballroom may not be a brilliant movie, but it’s a very good one – and an example of how budgetary constraints can lead to a better outcome. It marked the opening chapter of a career that began relatively modestly then exploded like a dynamite-rigged disco. Luhrmann performs best when he doesn't have vast resources at his disposal. Give him "everything and the kitchen sink" budgets and he loses whatever subtlety he may otherwise have exhibited. LATimes: Luhrmann and his team, including design collaborators Catherine Martin and Bill Marron, have told this version with visual panache as well as a distinctly modern pace and sensibility, understanding perfectly the necessity of camping up the comedy while leaving the romance charmingly alone. Because it is kidding on the square, because its parody both of old movie forms and ballroom society is done from the inside and with love, "Strictly Ballroom" offers a surprisingly wide variety of satisfactions. Roger Ebert: The movie, which crosses Astaire and Rodgers with Mickey and Judy and adds a dash of Spinal Tap, is a comedy posing as a docudrama about competitive ballroom dancing in Australia. Everyone in the movie takes the sport, or art, with deadly seriousness, and their world revolves around the Pan-Pacific Grand Prix Amateur Championships (which, despite its grand name, seems to be a local event). Like synchronized swimming (the most hilarious event in Olympics history), competitive ballroom dancing is essentially lighthearted fun spoiled by lead-footed rules. This is one of my favorite movies of all time! It's so cheesy and corny (is it a cheeto? ), and yet it makes my cry every time. It's super-quotable too. It's Baz Luhrmann's best film as far as I'm concerned! This movie is so damn funny. My husband and I still angrily yell at each other “What is so wrong with the way I dance? !” in terrible Australian accents. Paso doble is great, that is all. I unabashedly adore this movie. I think part of it is that the very sweet (ok, probably insanely corny) stuff has some acid moments as well, probably mostly in the persona of Scott's mother. And sometimes it's so straight-ahead with it's comedy (people barging in to declare someone's been in a car accident and broken their leg) that I just laugh like an idiot. This movie delights me and I love the leads and I always get sniffly during parts of it, and I love the paso doble and the "everybody come to the floor and dance for joy and not competition points" end. Oh GOD, I love this insane movie! The absurdist moments, the dancing, the costumes, the complete over the top hysteria of Gia Carides. All of it laced with Scott and Fran’s gently unfolding, softly sweet love story. It inspired my second book, in part, because I wanted to write about a ballroom dancer, heh. I adore this movie, and break down in the happiest tears when Doug starts the clap during the final dance. Doug makes the movie for me, especially when he finally says to Scott, "We lived our lives in FEAR!" Man, Fanfare is on a roll here. Three days, three older movies I absolutely adore. Even though the climax is sooo cheesy. And I love the way they make Fran look so absurdly awful at the beginning and of course in reality she's gorgeous. And how all the establishment dance folks have created their own small pond to be big fish in, but sometimes the movie pulls out and shows us how mundane and mediocre their real lives are, selling hot tubs or what have you. Hm. I've been thinking about getting a pet, and Tina Sparkle would make a great pet name. I sometimes yell "We lived our lives in FEAR!" for no apparent reason. This movie is pure joy and magic! I also just used it to explain the difference between interesting and boring ice dancing performances by referencing Scott’s terrible paso doble vs. Fran’s dad’s tremendous paso doble. I have a longsuffering friend who's had to deal with me yelling "SCOTT!" in a terrible Australian accent more than once. It's funny, speaking of ice dancing, after I watched the Virtue/Moir Olympics performances the other day, I was moved to watch the Strictly Ballroom trailer for the first time in ages! So I was especially tickled to then see this post on Fanfare. I watched it again with the kiddo and it held up well. I remember it took three tries watching it to make out that Doug was saying "Can I bend your ear for a tick," because the accents were so thick. My daughter was involved in competitive Irish Dance for years, and I feel like this movie helped me survive it all--the over-the-top costumes, the respect/disdain for the seemingly arbitrary rules, the drama drama drama. I can't wait to carve out a couple hours to watch this again. A friend I had in my twenties was VERY into ballroom dancing, and she adored this movie and considered it the funniest movie ever made about dance. From what she told me and what I witnessed when I sometimes attended dances with her, the ballroom dancing scene is quite a bit like the one depicted in this movie, because everyone takes it very, very seriously and gets overly invested in it. She especially enjoyed the realism of social economics in dance, because there's no money in dance and only dance teachers make anything out of it at all. All the dancers in the movie have ridiculous day jobs, such as selling hot tubs or makeup, and one guy retires from dance in order to focus on his "career in landscaping", heh. "Well, that was unexpected." I always thought Scott's little sister functioned like a tiny, one-person Greek chorus. 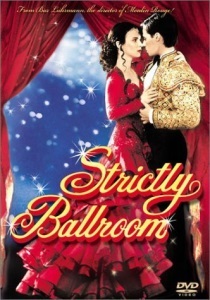 I was talking to my sister about this movie, and she said that she was watching ballroom dancing on TV (I think that this was in around 1998), and one of the performances was to a Beatles song, and one of the commentators commented (with a mixture of distaste and resignation), "Well, I guess it's time for ballroom to enter the 90s." I've probably gotten every single detail of this story wrong. 1. The character of Barry Fife seems to have been a stylistic and behavioral template for Donald Trump. 2. Would love to know how Fran's initial awful dress sense and left footedness at the start of the film can be aligned with her being raised by a secret ninja paso doble family. 3. One of the first and most influential mockumentary films - up there with Spinal Tap. 4. I think it is fair to cite the film as a major inspiration for the BBC show "Strictly Come Dancing" (and its various international "Dancing with the Stars" variants). The show makers appear to have taken the ideas of picky"no lifts allowed" official judges versus the audience, narrative of underdog dancers who go on to do great things, general attitude that any problem can be fixed by an even more flamboyant costume a bucket of glitter. Metafiler: a secret ninja paso doble family. This is one of my favorite movies of all time and I'm glad to see other people get an appreciation of it. I also went through a PBS-ballroom dance competition-watching phase in my teens which means that this movie was made for me. And I totes agree with rongorongo up there. Fran is deep under cover.